3:8 Juice & Eatery is your local juice & smoothie bar with fresh, homemade soups, sandwiches, salads, and more. Offering delicious plant-based food solutions, 3:8 Juice & Eatery is fast becoming a popular eatery destination! Whether you’re interested in vegan food options, overall healthy eating or nutrition & wellness support, we’d love to help you! Stop in today and ask about our Reset programs and experience a NEW kind of healthy! 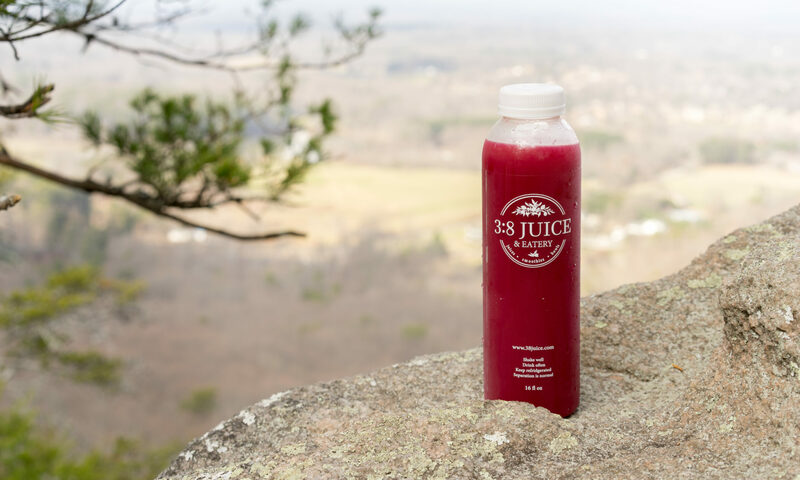 At 3:8 Juice & Eatery, we want to help you “Reset” your body so that “it will bring health to your body and nourishment to your bones.” What can a Reset do for me? A Reset can do several things for your body like reset your taste buds from years of being addicted to SOS (sugar, oil, & salt), help your detoxing organs (like your kidneys and liver) to perform better, and give your overburdened digestive system a much needed break. While giving your body this timeout, you can start to feel changes almost immediately. Be sure to work with your doctor if you are on any medications. Some helpful tips: The week before your Reset, slowly reduce and then eliminate all sugar, caffeine, and salt. This will lessen your initial withdrawal symptoms. Please be aware that these symptoms will be different for each person. Your symptoms may be headaches, body aches, even flu like symptoms. This is your body’s way of handling the withdrawal. If you have ever tried to stop drinking sodas or coffee, you know what this feels like! Incorporate more salads and wholefoods as much as possible. You are now ready for a Reset! We have several different options available to you. If this is your first time, you may want to consider the 15 day Reset. If you just want to reset your taste buds, a 1, 3, or 5 day Reset may be right for you. If you are looking for a life changing event, the 30 day Reset may be for you. Leisurely walking is the only exercise suggested during a reset. Drinking lots of water is a must! Let us help you find the perfect Reset for you. When you purchase a Reset with us, you will have exclusive access to our private Facebook page that will connect you with other people going through the same experience as you. This is so encouraging! We recommend that you juice the rainbow. When you choose different color juices throughout the day, you are giving your body a bountiful amount of vitamins, minerals, enzymes, micronutrients, and phytochemicals that each plant contains! In addition to the provided juices and salads, you will want to begin your day with a cup of hot lemon water and enjoy some coconut water, as needed, throughout the day. You may also enjoy a cup of herbal tea at any time during your Reset. As with any program, please consult with your medical professional before starting a Reset. What can a Reset do for me? A Reset can do several things for your body like reset your taste buds from years of being addicted to SOS (sugar, oil, & salt), help your detoxing organs (like your kidneys and liver) to perform better, and give your overburdened digestive system a much needed break. While giving your body this timeout, you can start to feel changes almost immediately. Be sure to work with your doctor if you are on any medications. Monday-Friday: 6:30 a.m. – 8:00 p.m.